There is nothing like a trip on a grand cruise ship. 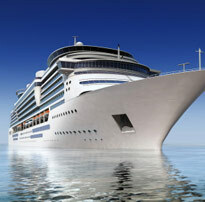 But finding the perfect cruise ship is not easy; it depends where you want to go and how you want to spend your time. Pacific or Caribbean, tropical or glacial - the many choices are up to you, but we will help. Talk to us, and we will make sure you make the best cruise holiday selection. Taxes and Fees not included. Some restrictions apply.